I recently attended a large trade show in Florida. Hundreds of vendors, thousands of attendees, acres of floor space. I was amazed at how powerful the simple business card was at this convention and how it has maintained its relevance in the world in the world of trade shows. etc. Most people had a stack of them in their pocket or briefcase. Very few scanned mine with their smart phone (even though mine was sporting a QR code!). Most people were happy to take a copy of one of mine. You would think in a place like Orlando, in 2014, I would be laughed at for even thinking of having business cards with me! All in COLOR and ALL COOL AS AN ICE CUBE IN WINTER! Here is one of the coolest and EFFECTIVE things you can use to introduce a new product or announce an offer. These 8.5″ x 5.5″ THICK cards (.0023″) are perforated to open with a big door or six windows… Look! Hidden message under the door(s) ! 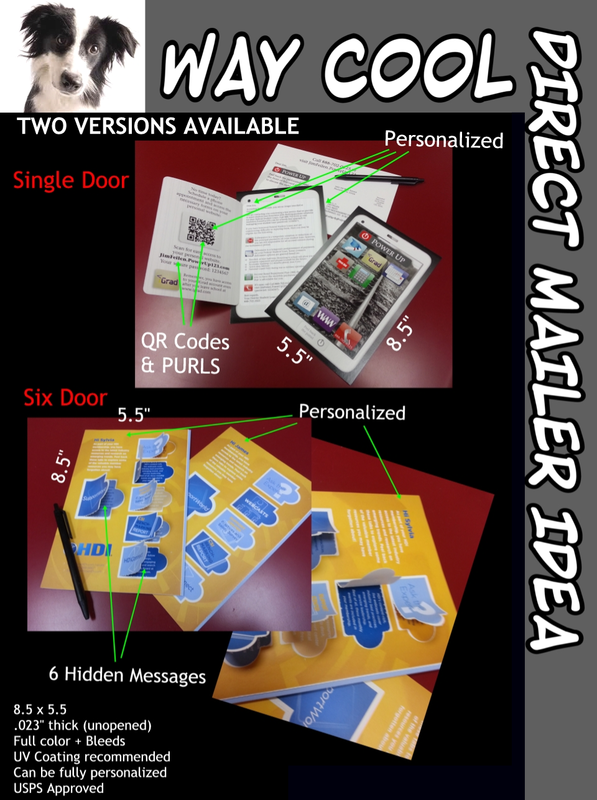 Since these are variable data cards you can even mix up the messages…or hide targeted and variable photos under the doors (great for an art opening or a CONTEST!). SICK (as my nephew says). Very reasonable with the REACH of an orangutan! It is time to learn about the foundation of a typical sheet of paper used in offset printing. 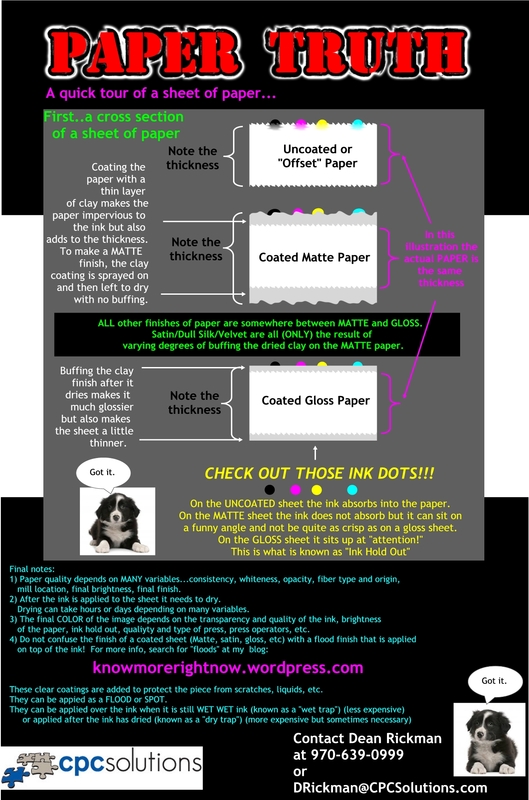 Here is a quick study of paper, its coating and how it deals with ink. Matte through Gloss and even uncoated, this addresses the what and why of ink hold out…an important reality in the world of resolution and print clarity. Here is a page from Sappi that describes a few more of these details. Have fun! Call if you have any questions! How often have you wished you knew how to make stuff out of cardboard? If you are like me, these thoughts haunt you deep into the night. The other day I saw a post on MASHABLE and could not help but re posting it here. I actually copied it from their post to my post so it would not go away. 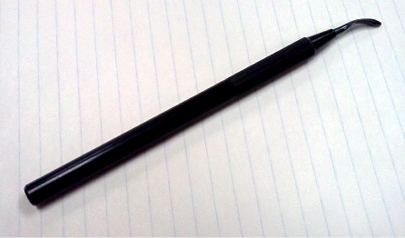 It uses paper…one of our favorite elements…and imagination…another favorite element. Make one and send me photos! 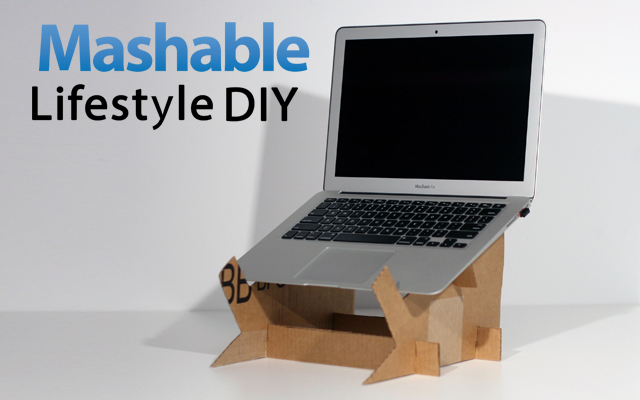 This easy-to-create do-it-yourself (DIY) laptop stand will add some extra height to your screen, improve your computing posture and save you money. Building your own cardboard stand is simple. Download, print and cut out this template sheet. Next, trace the designs onto some cardboard. Once you’ve cut out your pieces, assemble them as shown to create your own stand. Once assembled, you’re ready to decorate your laptop stand any way you’d like. Send us your completed project photos using the photo widget below – we may even share it to our Pinterest boards. We can’t wait to see what you come up with! Do you need a paper that is resistant to water, peach juice, coffee, milk, rain, sweat, tea, watermelon, mud, ketchup, snow, tears, soap and many other liquids? Click on this animated GIF presentation to learn more! I know…I have talked about Ultra Green before and am committed to torturing it as often as possible. Today it’s a spilled coffee test (click here to see how I fed my horse on this stuff this past summer). Be so happy that this sort of product is available…next test: I am going to put some Ultra Green under water for a MONTH! I will be dunking it in the Gunnison River and will report back! WINNER! WE HAVE A WINNER! Think you know? Email me at deanrickman@yahoo.com and tell me what you think! You are SO SMART! You MIGHT win a cool prize! When we award the prize I will post the correct answer in this blob post. Careful! The correct answer may also give away your AGE! The correct answer is a BURNISHER (from Letraset). What the heck is an Uncompahgre?? Fresh off one of our Heidelbers! 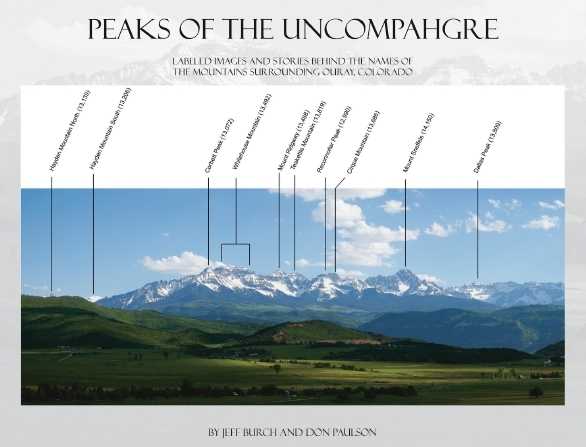 This is a book by Jeff Burch and Don Paulson and features beautiful images from the Uncompahgre (un . come . PA . gray) region and features the many peaks that are in the headwaters of the Uncompahgre River and all around Ouray, Colorado. Many of these images are labeled and there are many great stories in the book that explain the origins of these peaks’ names. Typical labeled page. 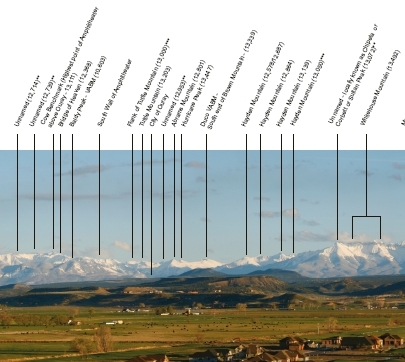 There are ten crossover pages similar to this with accurate labels of the peaks in each vista! The book is a 52 page, landscape, 11″ x 8.5″ perfect bound limited edition. The cover features our soft touch aqueous finish. The entire book is printed at Stochastic 18 Micron V-2 (375 linescreen) on our Heidleberg 8 color perfecting press. The book is printed on our (award winning) House matte paper stock and the interior pages each have a flood aqueous coating. Learn more about the book at Jeff’s web site, where you can also purchase your own copy! One of many images featured in the work. ...to Know More Right Now. Here you will find lots of information here that will help you Know More RIGHT NOW in the print marketing world. Email me at DeanRickman@yahoo.com if you have questions and thank you for visiting!